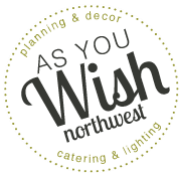 As You Wish NW weddings and events specialize in catering, lighting, planning, rentals, wedding coordinating, set-up and take down for your any event, especially weddings. How do you see your big day? Tell us your dream day and we'll help it come true. You have a vision, we have what it takes to make it happen.